A simple answer to the question, “What is teamwork?” is a group of individuals working together on a common project, goal, mission, or objective. Teamwork is how the members within a smaller team work together. 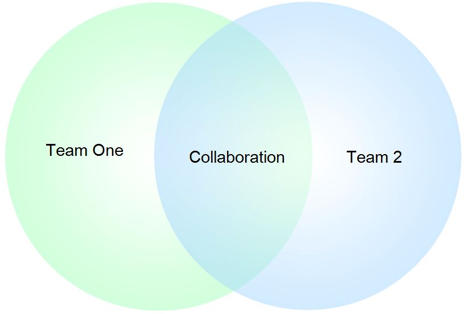 Collaboration is the power of two or more teams working together. For example, when I worked in the mortgage business, we had the underwriting team, the processing team, the closing team, and the sales team. Those are the basic teams that existed in every single mortgage banking office is the ‘90’s. Teamwork is about individual teams of about 10-12 people that work together on a regular basis. So, inside of a company, even a small company, you can have multiple teams, like an underwriting team, a sales team, etc. Teamwork is about how the individuals within those groups work together. In the above mortgage company example, those teams (underwriting, sales, etc.) worked very well together. Collaboration is how those individual teams come together and work towards a common goal, project, mission, or objective. What is teamwork in business and what makes it different than teamwork in other areas, like sports? I don’t know that there really is much of a difference. In both the workplace and in sports, you’re still striving for a common goal or mission. Both require that the team possess harmonizing skills. For example, in football, if everyone had the skills of a quarterback, you wouldn’t be that great. You need the skills of a lineman, a running back, a wide receiver, and a punter to have a balanced team. This will put the team in a better place to accomplish the mission. On a football team, baseball team, basketball team, any kind of team, they all have to have a variety of skills, and they have to be committed to the mission, which is to win the game. Getting to the end results. Producing the event. Satisfying the customer. All of those are the same in the workplace. And then the critical element comes in; they have to pursue the objectives on an agreed upon course. It’s not just enough to know that they want to win the game, they have a game plane and by following the game plan they agree on the course on how they are going to win that game. Ken Blanchard and Don Schula wrote a book called, “Everyone’s a Coach,” about 20 years ago, and They talk about a lot of similarities between sports and the workplace. Members of a team hold each other accountable, whether we are talking about a basketball team or not. In the ‘90’s, Michael Jordan would call out others if they weren’t doing their job, if they weren’t pulling their weight. I believe there are more similarities than there are differences. We just have to change the mission. We’re not out to win a game, we’re out to get the product to the marketplace, we’re out to satisfy the customer. Apple is out to keep the secrecy of their new latest and greatest release. It’s all about that mission. Whatever that mission is, that’s the key factor. Teamwork is individual people coming together on a common project, goal, mission, or objective.